This is one of my favorite meals because it’s delicious and can be scaled from serving size and quantity to optional ingredients. The dish is super diverse and can be eaten for lunch, dinner, hot, cold and is also a hit at any party. You can easily modify to taste. Get saucy by sautéing 3 pieces of chopped garlic in 2 tbsp olive oil - on medium heat - until golden brown. Add one large can stewed tomatoes and one small can tomato paste. Keep on low heat. Meanwhile if you plan to add pasta, and this is purely optional - boil water with a drop of olive oil and a pinch of salt - cook your pasta to your desired consistency. Spiralize three zucchini and place in a large bowl, if you don’t have a spiralizer you can buy pre spiraled zucchini. Cube three pounds fully baked chicken breasts. I ALWAYS have baked chicken breasts on hand and it serves me well - typically made on Sunday each week. If you don’t have any baked chicken on hand, allow 40 minutes at 350 degrees to bake some, or buy it pre-cooked. Add the chicken and cooked pasta to the sauce and keep warm on your stovetop. 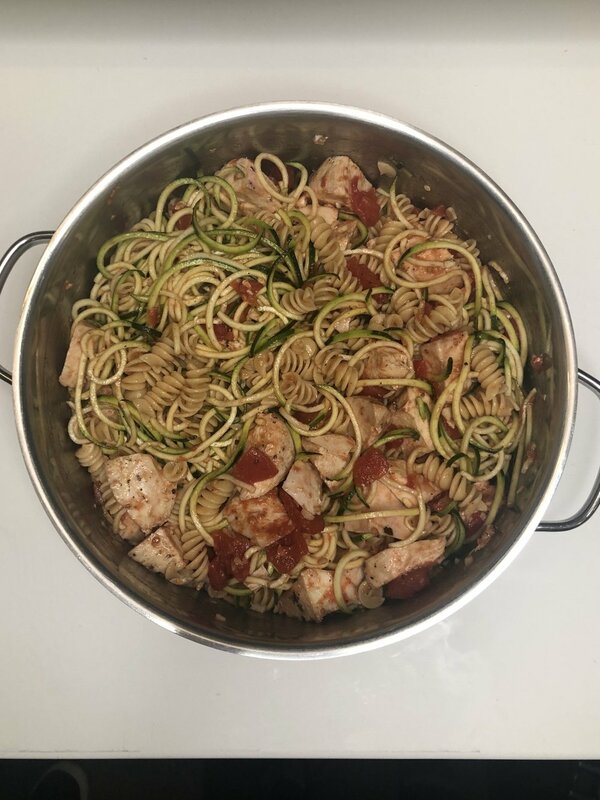 Combine the raw zucchini, chicken and sauce into a cold bowl and enjoy!